is the point of contact between the microboard and government department responsible for the management of associations in your state. ask all nominees for office bearer positions to sign a short declaration form asserting their suitability for the role and declaring that they have no serious criminal convictions or insolvent. The work of a Microboard is around helping the person at the centre achieve their goals for a good life. But how do you know how well you are tracking? 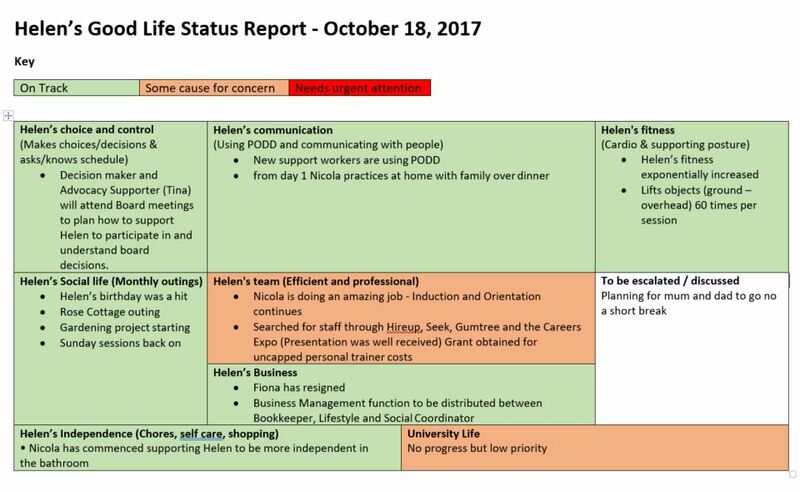 Here is an example of a report to the microboard on progress towards meeting goals. Do you have any other ideas you would like to share? Contact us and let us know how you report on progress to your board. Whats the difference between a circle of support and a microboard? Do you already have a circle of support and need some help in talking with the members about what a microboard is and what’s involved? We have produced this short video that you can show them to help them understand what might be different for them and what might be the same. You may so like to download this one page summary table as a talking point. Children learn to speak by being immersed in language. All around them people are modelling how to speak. This modelling happens not only when people are speaking to the child but also to each other. It’s the same for learning a second language. The best way to learn to speak French is to go to France. People learning to use alternative communication methods often experience a big difference in the language used by people around them and the language they are expected to use on their communication system. To enable them to learn to use their communication system their entire network of family, friends, supporters and people in the community need to be able to use their communication tool. But how do you enable that to happen? Here are some ideas….. Put together a powerpoint training pack you can share with people about how to use the tool. 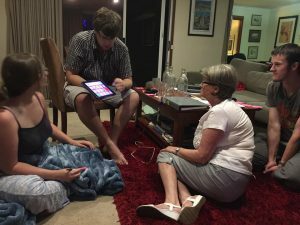 Group story writing – make up a silly story and tell it using the communication device. Each person takes a turn to write one line of the story. You can provide a starting sentence to the story to get everyone thinking. For example One day the caterpillar hatched out of a tiny egg and he was very hungry. Then the murders began…. Hold a silent morning tea – invite people over for morning tea or go out to a cafe and nobody is allowed to speak for the entire event. Like in any profession, there are great support workers and there are ordinary ones. 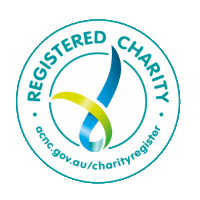 If you check out some of the adverts for support workers on www.seek.com.au you will soon find that in many adverts the only requirements are qualifications in disability care, a working with vulnerable people card and a drivers licence. Job adverts like this don’t inspire great people to apply as great people are looking for great opportunities. Tip #1: Include an interesting description of the person to be supported. Describe what the person to be supported likes to do for fun or what they would like to be able to do. This will attract people with similar interests and having similar interests is great for building good relationships. Having a good relationship with the person who supports you is vital for good support. I love music, disco lights and live gigs. I also love the sun and being outside. I’m fascinated by anything which has moving parts, and I think cruising around in the car with the music cranked up is pretty cool. I’m into being both physically and mentally active. I’m really enjoying drama classes right now, being on the stage and being the centre of attention. People say I’m very charming and a smooth operator. I’m determined, and curious. I’m a Leo and that describes me perfectly! I was also born in Yorkshire which might be why I’m proud, and stubborn. I’m soon going to be leaving school, so I have started doing work experience which delivers magazines to waiting rooms. I’m hoping to develop this into a mail delivery business. I also have a disability and need help to achieve my life goals. Tip #2: Use colour that reflects the personality of the person to be supported. The look and feel of an advert is also key to attracting the right kind of person. The look and feel should make people reading the advert feel a certain way. Colours can make us feel different emotions. Think about the personality of the person to be supported and their personality and choose colours that align with them. Include a photo of the person to be supported doing their favourite activity to highlight the fun and interesting things about them. Ideally the photo should be a closeup shot that shows them enjoying the activity. This will again help create an emotional response to the advert and help you attract the right kind of person. Think about the person to be supported and their personality traits and consider what personality traits a support worker should have to increase the likelihood of building a good relationship. Also think about the person’s goals for the year and the kind of person that could help them achieve those goals. Here are some examples….. Check out this list of personality traits to find ones that best describe what you are looking for. able to take direction and follow through on tasks on time. Having a common interest can improve the likelihood of a good relationship with the support worker and can also bring about opportunities for developing further relationships with others who have a similar interest. Include a list of interests that would make applicants ideal candidates. Also include the above and beyond the basics stuff like that you will need your support workers to do. Examples are teaching, mentoring, using technology, networking, conflict resolution and so on. It’s ok to be creative and intriguing! Are you the…mentor, life coach, Personal Assistant, Isaac is looking for? Are you a creative and resourceful teacher, guide, right hand person? Are you looking for…..a job which stretches your boundaries, where you work outside the box, which explores new territory…???? Kind of like working for Google? Are you a teacher with creative genius who wants to walk on the wild side? …a free-spirited 18 year old young man. It’s important to include a description of the Microboard, it’s culture and role so that potential employees understand who will be their employer and what it’s like to work for them. Explain what the purpose of the microboard is and what your microboard is like. 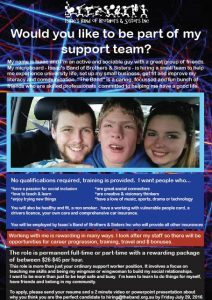 My microboard – Isaac’s Band of Brothers & Sisters – is hiring a small team to help me experience university life, set up my small business, get fit and improve my literacy and communication. “The Band” is a caring, focussed and fun bunch of friends who are skilled professionals committed to helping me have a good life. Make sure you include instructions on how to apply. You can also be creative here. Asking candidates to submit a two minute video explaining why they want the job can help you weed out those that are not serious about the job, have technical skills and the confidence you may be needing in a candidate. Alternatively you can ask them to send in a CV and a statement that describes how they meet each of the criteria you have listed in your add. Many of our families experience gathering together people for their first meeting, getting great ideas and then nothing happens. That’s really frustrating! Check out Sheree’s video overview of the kinds of things you can do using PODIO. Learn more about our PODIO coaching package. Communication is a really important focus for microboards. We have an important role to play in helping the person at the centre of our microboard if they have complex communication needs to learn to be autonomous communicators. Being able to communicate is not just about being able to ask for what you want. While in the early days it’s a great place to start modelling because the person can see that they can get what they want when you use the communication device. But communication is not just about getting what you want. It’s also about building relationships with others, sharing ideas, asking questions and so on. It’s important we don’t get stuck only using the device for requesting. 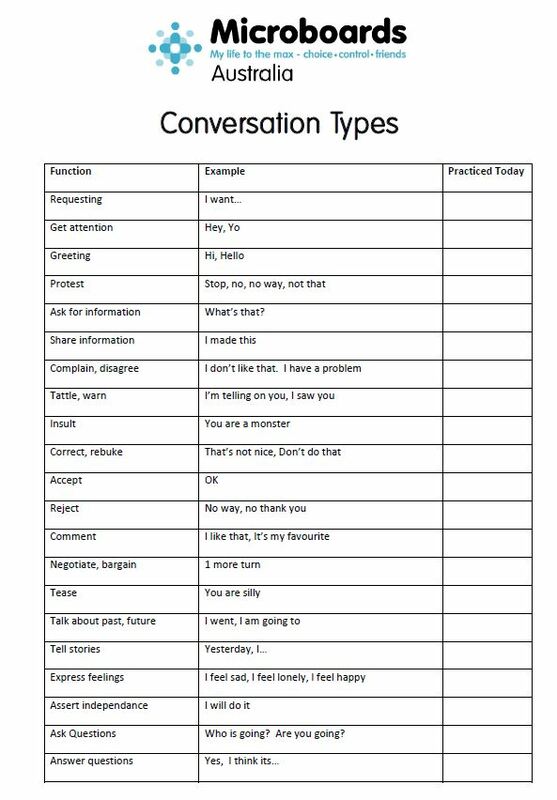 There are so many more conversations to be had and this tool will help you be mindful of the other kinds of conversations you can have throughout the day. This tool will help you to identify people to ask to join your microboard. Write down all the places you go or could go during a typical week across the top of the worksheet. Write all of the people you each know or see regularly in those environments – even if you don’t know them well or don’t think you could ask them. Don’t rule them out yet just write them down. 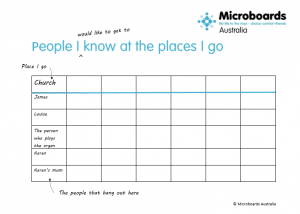 Think about the kind of people you would like in your Microboard – people with similar interests people who have useful skills eg social networking, business, teaching etc, people who are fun and friendly and so on.